There are many fine walks in Dún Chaoin and its environs. Below please find some information on the various walks in the parish. No excuses, put on your walking boots and get out into the fresh Atlantic air! This is one of a large number of National Looped Walked of high quality which has been developed by the local community with the assistance of Fáilte Ireland. This walk was developed with the help and cooperation of local landowners and walking groups. We are indebted to them. Please respect their land and livestock. A map of the walk is available locally. The walk begins and finishes in the Blasket Centre car park. Follow the green and white signs. Enjoy a tea or coffee afterwards in the Centre Restaurant or in the local pub, Tigh Kruger. A electronic map and description of the walk is available on the everytrail.com website here. Walking with kids? Try out our Photo Orienteering Game at the following link- suitable for children. Siúlóid na Cille . 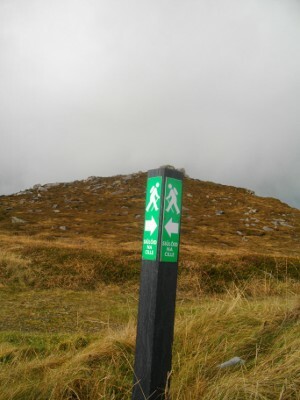 The National Way-marked Way, Slí Chorca Dhuibhne or The Dingle Way which starts and finishes in Tralee, passes through Dún Chaoin. It takes on average up to eight days to walk the full route. Some of the best views in Ireland are to be seen along the Dingle Way. 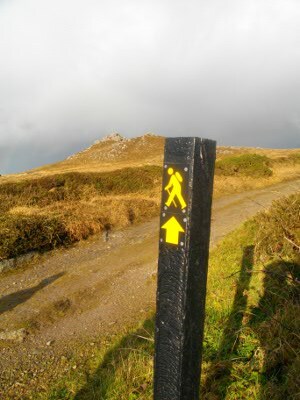 The Dingle Way (and all national way-marked ways) is waymarked using a yellow symbol as shown in the photo. Our local community group has erected a number of map boards which welcome walking visitors to the area. A description of the Dingle Way is available here. The easiest way to climb this mountain is to park your car in a safe spot on the Clasach road – the mountain pass between Dún Chaoin and Ventry. Follow the mountain road which winds its way up to the top. There is no waymarking on this walk. The summit is marked by a pillar. There is a nice easy circular route in the Blasket which takes approx. 1 hour and 15 minutes or for the more adventurous one can continue to the back of the island. Caution is needed. There is no waymarking on this walk. This is an old pilgrim walk which is just over the mountain from Dún Chaoin in Ventry (Fionntrá). This walk starts at the top of the beach at the Ventry Village side and makes its way across the Peninsula through green roads, paths and fields to Mount Brandon, 18 km away. The Cosán is waymarked using a yellow symbol of a monk. There are many historical sites of note along the Cosán, including the Norman Castle at Rathanáin, Gallarus Oratory, the church at Cill Maoilchéadair and much more. A description is available on Irish Trails at this link and a comprehensive Irish/English interpretation with maps and videos made by Scrogall TV and Oidhreacht Chorca Dhuibhne is available on the everytrail.com website here. This is a way-marked loop walk which begins at the top of a lovely beach in Clochar, ‘Tráigh Chloichir’, roughly 4km to the north of Dún Chaoin. This walk is very level and takes about an hour. Again this walk passes through private land and please respect the landowners who have given permission to visitors to access their land. A description of the walk is available from Irish Trails here or an account by this author is available on the everytrail.com website here.